Centre County PAWS is pleased to announce it is offering a summer program for children. 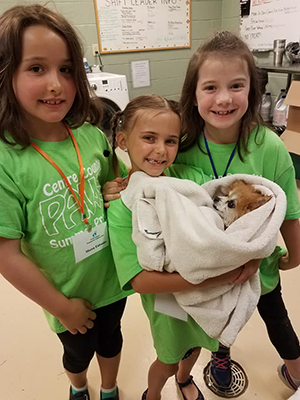 PAWS will provide a behind-the-scenes, hands-on, fun-filled experience showcasing what we do for the animals while teaching children caring and responsible pet care and pet ownership. This is an interactive program with fun educational activities for kids who love animals. Program participants will spend an average of two hours each day interacting with the animals. Other fun and educational activities! Registration for our 2019 Summer Program is now open! Click here to complete the registration form. Registration and payment includes all activities, materials, daily snacks, and a PAWS Program T-Shirt. Click here to register for 2019 PAWS Summer Program! Registration and payment must be submitted to secure participant's spot. Registration is limited to 12 children per session and is filled on a first-come, first-served basis. The regular cost to participate is $210 per participant. If you are enrolling more than one child per family, the fee for the first child is $210 and each additional child is $185 ($25 family discount). Regular registration dates are February 14, 2019 through May 10, 2019. There are a limited number of scholarships available. These are given to needs-based participants only. This is a drop-off and pick-up program. Before and after daycare is not available. Due to limited enrollment, there are no refunds. Sorry no exceptions.